“Welcome to Vermont” reads the friendly sign. You just passed into the Green Mountain State and are driving along a two-lane road and are surrounded by snow-capped pines and outlines of wintery mountains backed by crisp blue skies. Something is different about Vermont, you notice. No flashy billboards blind you from the natural beauty and as you pass through a small town with an old-timey general store and tall church steeple at the center, you get the sense that life has slowed down and you’re far removed from your worries and work commitments. The charm of Vermont’s landscape, towns and people have pulled you in, just as the promise for great skiing and snowboarding led you there. Steeped in ski and snowboard history, Vermont has something not all other winter destinations have: a deep sense of snowsports culture and community dating back to the early 1900s. Home to the first rope tow erected in 1934 at Gilbert’s Hill in Woodstock, the birthplace of the National Ski Patrol and the first Nordic Center started by the famous Trapp family, Vermont is a destination like no other. While the ski resorts dotting the Vermont map vary from luxurious to budget and from challenging to family-friendly, you’ll always find a smiling face and a friendly community ready to receive you. Vermont welcomes between 4 and 4.5 million skiers and riders to resorts each season, making it the No. 1 state in the East for skiing and riding and third in the country. With 20 alpine destinations and 30 cross country ski destinations, there is a lot to explore. In fact, there are over 6,000 skiable acres open for downhill skiing, and nearly 1,300 miles of Nordic track to glide upon. An average of over 200 inches of snow falls over the state of Vermont each season, but 80% of the alpine terrain is supplemented by snowmaking. There are even seven Nordic resorts that have snowmaking to ensure great cross country ski conditions as well. With so much terrain and so many destinations, it can be hard to pick the best resort for you. Some resorts offer bountiful amenities like spas, outdoor pools and hot tubs, numerous restaurants and shops, ice rinks and kid-friendly activity zones, while others offer affordable lodging and lift tickets without all the fuss. The larger resorts with many amenities also offer a variety of other activities for the non-skier or rider, like topnotch fitness centers, snowshoe tours, snowmobiling and even zip lining. To find the right resort for you, visit skivermont.com and explore the Resort Finder. You can search resorts by activities, location and amenities, and it will hand pick the perfect destinations for your needs. Also found at Vermont’s resorts are great events throughout the season. 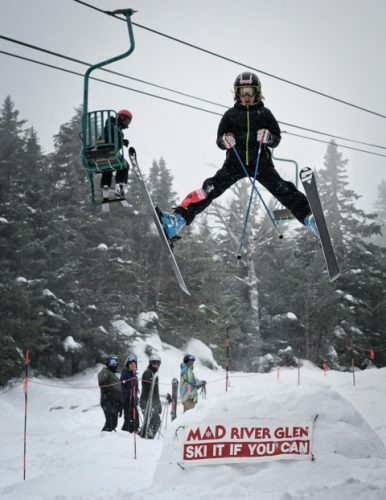 Don’t miss the thrills of watching top athletes compete at the Ski the East Freeride Tour (STEFT), which visits some of the gnarliest terrain found in Vermont, or the multitude of rail jams and downhill races that can be viewed throughout the season. Killington’s spring rite of passage, the Nor-Beaster, is a season-long celebration of music, festivals and on-snow competitions from March 1 until closing day. There is a Nor’Beaster season pass available at a huge discount. Mount Snow does Valentine’s Day like no other with its Cloud Nine Nuptials where couples can renew vows or even get married at the top of the mountain. Stratton’s 24 Hours of Stratton is a daylong race and FUNdraiser to raise money and awareness for underprivileged children in Vermont. Want to enjoy the slopes during the holidays? Guaranteed there will be fireworks, torchlight parades and live music. And don’t miss the New Year’s dog parade and K9 couture show at Sugarbush Resort. Vermont produces more US Winter Olympians per capita than any other state by a long shot. Nineteen athletes with Vermont ties made their way to Sochi in February 2014 to compete for their country. That said, it’s not only the number of Olympians from Vermont that is impressive, it’s the quality. Six Vermont athletes took home medals from the 2014 Olympic games in Sochi. That is six out of 28 total medals for the USA, meaning 21% of the winning athletes have Vermont roots. Not bad for a little New England state of only 625,000 inhabitants. A breeding ground for top competitors, Vermont is also a great place to learn to ski or snowboard for the first time. Professional lessons are available at all resorts and special packages from resorts give great incentives to keep learning, like a free pair of skis or a season pass. Kids and parents can also be instructed by an Olympian at Cochran’s Ski Area. Gold medalist Barbara Ann Cochran runs a Ski Tots program for those as young as three years old. With some of the tallest peaks in the area and favorable weather patterns, you won’t find better snow on the East Coast. That said, Vermont resorts are so intent on delivering a quality experience that they upgraded their snowmaking systems this past season with over 2,300 new low-energy snow guns, a $15-million investment. The new statewide snowmaking upgrade means better snow with less energy and the ability to blow snow at higher temperatures leading to longer seasons. Vermont resorts also invested in upgrading uphill transportation. New in 2015 is Okemo’s Sunburst Six lift, a new, high-speed, six-person bubble chairlift with heated seats – the first of its kind in North America. Stratton Mountain Resort introduced 58 new gondola cabins for a more comfortable ride to the top of southern Vermont’s highest peak, and Stowe Mountain Resort completely renovated its famous summit gondola on Mt. Mansfield and improved family lift service on lower Spruce Peak with a new quad chairlift and two new carpet surface lifts. Killington’s Peak Lodge facility opened its doors at the 4,100-foot level of Killington Peak in December 2013, replacing the original structure from the late 1960s. The new 15,000-square-foot facility includes seating for 300 guests, a food venue featuring a selection of fresh local fare, a full bar, and lounge areas with couches and coffee tables. Like the K-1 Express Gondola, the Peak Lodge sources its electricity via Green Mountain Power’s innovative Cow Power program. PreviousTurkey Hill Experience: Bring Friends. Eat Ice Cream.